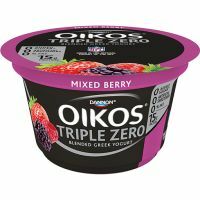 Dannon® Oikos® Triple Zero Mixed Berry is made with the sweetness of Stevia, a zero-calorie sweetener and sugar substitute sourced from the stevia rebaudiana leaf. It has 0 added sugar, 0 artificial sweeteners, and 0 fat—plus 15 g of protein per 5.3 oz. cup.